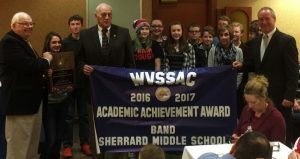 The Sherrard Middle School Band won the West Virginia Secondary School Activities Commission “Academic Achievement Award” and was presented with a plaque and banner at the AAA State Championship football game on Wheeling Island. The WVSSAC recognizes one high school band and one middle school band in the state each year. This award is based on the band’s grade point average and student attendance rates. 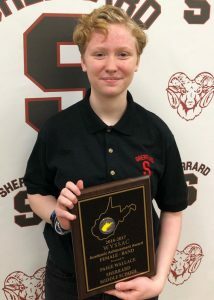 Paige Wallace, a Sherrard Ram 8th grader, won the middle school WVSSAC “Individual Female Band Member Academic Achievement Award” and was also presented with a plaque at the AAA State Championship football game. Four high school and middle school band students, two males and two females from each group, are recognized in West Virginia each year. This award is based on the student’s GPA, attendance rate and extra-curricular contributions to the school and community.